Add depth & punch to your audio system! 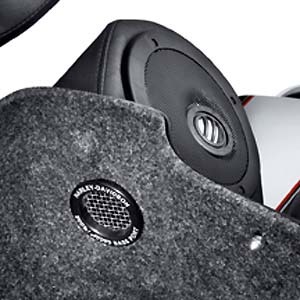 HFWP-85: The WoofPak integrated drop-in subwoofer system designed to fit into H-D's King and Ultra Tour Paks. Features simple plug and play installation to work with any audio system installed on your bike. Add the missing bass everyone craves with this clean system. Features a Polk new 8" MM dual voice coil subwoofer and Sony's xPlod 500 watt mono amplifier. 76013: Audio Bass Booster Tour-Pak® Port Kit. 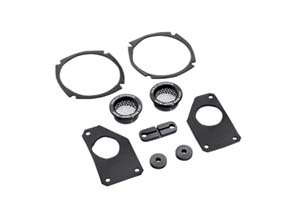 This Bass Booster Port Kit provides significant improvements in bass response without adding a subwoofer, and has no impact on usable Tour-Pak® carrier cargo capacity. When installed, the open port permits the speaker pod to "breathe", reducing the compression effect that limits speaker cone travel. You hear a 21% increase in bass response for better sound with a fuller bottom end, and an 82% reduction in peak distortion for accurate bass reproduction. Noticeable improvement is gained with both Original Equipment and High Performance Speakers. The kit contains black-anodized aluminum ports, stainless steel audio-transparent grills, and unique Sound Sealing technology to give you that Boom! you were looking for. Fits '06-later FLHTCU, FLHTCUTG, FLTRU and FLHTK models. Also fits models equipped with King Tour-Pak® and Boom! Audio™ Rear Speaker Pod Kit. Does not fit with Boom! 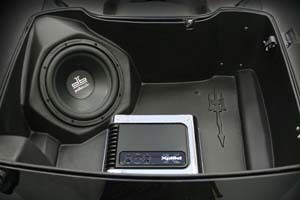 Audio™ High Output Sound System.